Four friends-revered acoustic musicians-coming together to explore and break the boundaries of what Stringbands normally do. 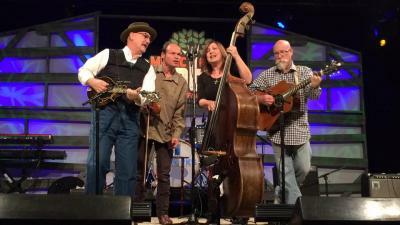 Their music is high-energy roots Americana, flavored in tradition, with a mix of old-time, blues, and bluegrass. They are at once paying tribute to the early sounds that influenced them, while simultaneously creating their own unique brand of modern Stringband music. Watching Helen Highwater Stringband play gives a glimpse into how a polished quartet communicates: cueing, body language, sonorous harmonies, strong rhythms, and virtuosic leads, all while maintaining a heartbeat right in the center of the group. Their music bounces and dances while staying rooted but not frozen, and recognizable but not predictable. Identifiably classic Mike Compton mandolin, the fretboard magic from David Grier’s guitar, Missy Raines’ animated and solid bass playing, and Shad Cobb’s fierce fiddle slides all combine to deliver pure entertainment. Add their masterful harmonies and you have the complete package. It is inspiring to see people at the top of their game, and these musicians are some of the absolute best at what they do.